The Audio Spotlight is a revolutionary directional audio technology that creates sound in a narrow beam, just like light. Aim the flat, thin directional audio speaker at your desired listening area, and provide all of the sound and none of the noise.™ Many companies throughout the world have chosen our patented focused sound speaker technology to provide state-of-the-art, precisely controlled audio for their trade show booth displays and conference kiosks. Amaze your clients and prospects with a unique directional sound experience. Avoid a jumble of sound, even with many sources. "Illuminate" products with focused sound. Place sound only where it is wanted. An unassuming commercial property in New York City's trendy Meatpacking District was taken over to create a pop-up exhibit honoring the life and work of Gabrielle 'Coco' Chanel and her historic fragrance, Chanel No. 5. Open to the public for 10 days in May 2015, the city's residents were treated to a collection of five massive, interactive exhibits, each one designed to appeal to a variety of senses. For the 'Composition' exhibit, motion sensors activated by guests triggered independent rays of light, and a network of AS-24i Audio Spotlight directional sound speakers projected unique musical "notes" for each ray, reflecting the imagined musical harmony of Chanel's classic No. 5 scent. Aptly referred to as a "Light Organ," the entire physical room itself became a living, interactive instrument, played by the visitor, and powered by the focused audio beam producing capability of the Audio Spotlight. 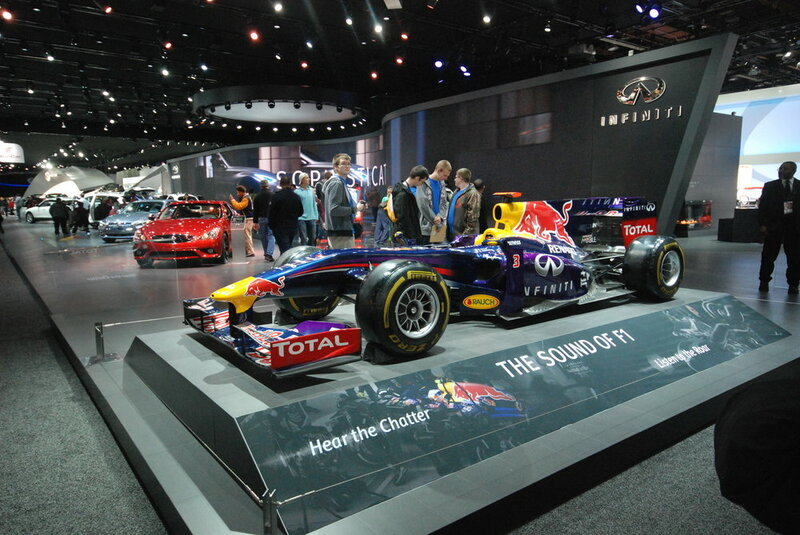 Red Bull and Infinity wanted to "wow" their guests at the 2015 Detroit Auto Show, and using a series of AS-24i Audio Spotlight directional sound speakers, they did exactly that. The impressive Red Bull Infinity Indy racecar sat atop a riser, framed by a base featuring printed messages that read "The Sound of F1" and "Hear the Chatter." Completely concealed behind the thin fabric graphic were AS-24i focused sound speakers, appropriately delivering the roar of the race car track, and the sounds of pit crew chatter, right there in front of the car, and only there. Since the directional audio beam produced by each AS-24i directional speaker was more than powerful enough to penetrate the exhibit's stretch fabric, the thin, flat speakers only enhanced the presentation, and didn't interfere with the visual aesthtics whatsoever. Floor indicators that helped show where each beam was aimed and audible added a nice touch. The exhibit drew a lot of attention at the show, by press and attendees alike, and Red Bull / Infinity were very pleased with the Audio Spotlight's ability to beam separate focused sounds so close to one another. 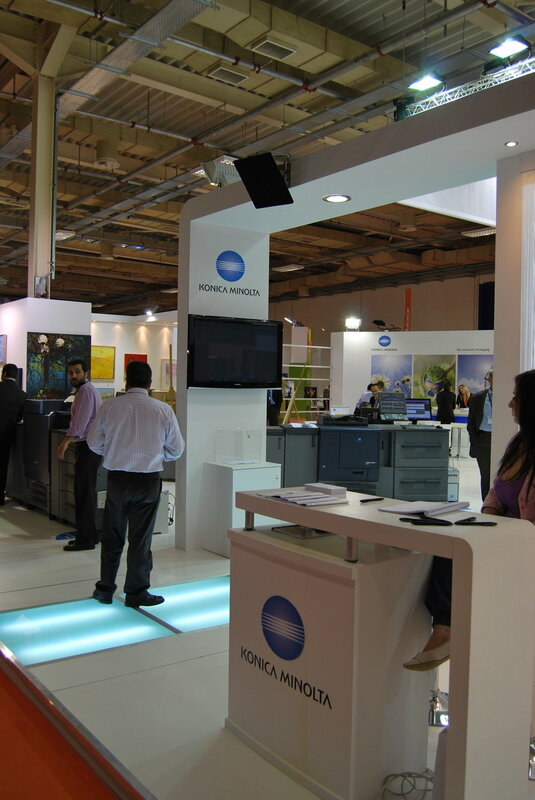 When Graphica 2011 rolled around, Konica Minolta sought to separate themselves from the visual communications pack with a unique trade show exhibit. Harnessing the power of the Audio Spotlight directional speaker system, a focused beam of sound was cast out towards the common walkway, with messaging that enticed attendees to step into their booth entrance and investigate the products on display. A narrow strip of backlit flooring indicated the sonically activated area, where announcements of their new bizhub PRESS C8000 model sounded loud and clear thanks to a single AS-16i Audio Spotlight speaker. Mere steps away the message was inaudible, fascinating both visitors and other exhibitors alike. When nomx wanted to make a splash launching its brand new secure communications products at ISC West, the largest security event in the United States, they turned to Audio Spotlight directional sound technology. A series of three product exhibit tables lined the back wall of their impressive 10'x20' booth, and with only a few short feet between each setup, there was zero tolerance for sound bleed. In addition to the product display cases, each of the exhibits included a TV with product messaging. A single Audio Spotlight focused sound speaker mounted directly below each flat panel delivered private sound straight forward, to that screen's viewer exclusively – all without headphones, and without disturbing the neighboring booths or breaking any show rules. 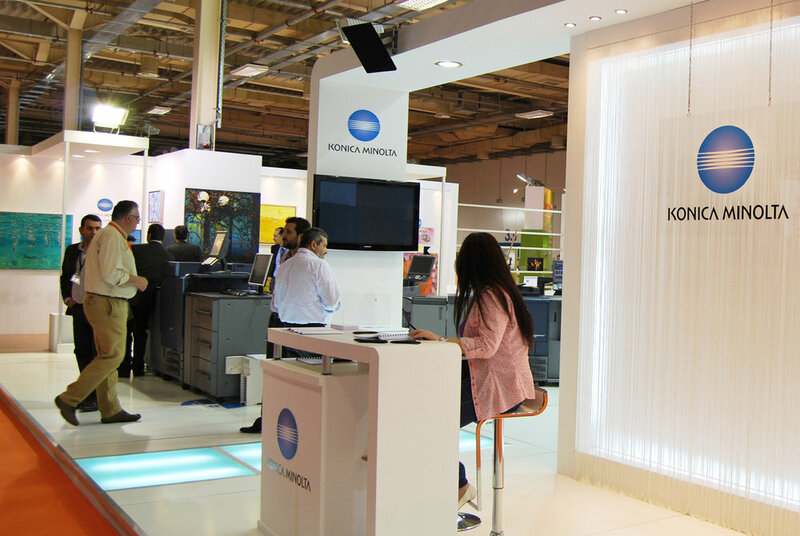 The staff of nomx reported excellent results from the AS-16i directional sound speaker in their booth at ISC West, and said their set of Audio Spotlight speakers would be travelling with them for the rest of their foreseeable expo engagements.